Naples, Fla. (May 25, 2018) - According to the April 2018 Market Report released by the Naples Area Board of REALTORS® (NABOR®), which tracks home listings and sales within Collier County (excluding Marco Island), Collier County enjoys a 7.76 month supply of inventory compared to a 4-month supply nationally. This is great news for Naples REALTORS® as they transition from a very busy high season to what broker analysts believe will be a very strong summer. "Summer buyers are going to be very happy this year because there will be plenty of choices," said Mike Hughes, Vice President and General Manager for Downing-Frye Realty, Inc. "Inventory growth has been good across all price ranges and geographic territories." According to Cindy Carroll, SRA, with the real estate appraisal and consultancy firm Carroll & Carroll, Inc., the rate of inventory loss is declining and she predicts the Collier housing market will become even more stable before the end of the year. Carroll considers a 12-month supply of inventory a stable market for Collier County. Nationally, a stable market is reflected as having a 6-month supply of inventory. Even though April's inventory fell 2 percent to 5,793 from 5,920 in April 2017, it's actually rebuilding from an annual low of 4,608 properties in inventory at the end of September 2017. "The reality is, the real estate market is doing much better this year than in 2017," said Hughes, considering the 2018 statistics includes the period of time when Hurricane Irma stalled home sales activity for nearly six weeks starting in September (and as reflected in the 4Q 2017 Market Report). Condominium inventory grew 2 percent in April to 3,003 units, over half the entire market, from 2,934 units in April 2017. The $300,000 and below price category experienced the highest increase in inventory (7 percent) to 1,472 units from 1,378 units in April 2017. Pending and closed sales of condominiums in this low-end price category were also strong, with a 17 and 14 percent increase, respectively. Interestingly, the median closed price of condominiums in April dropped 8 percent to $271,000 from $296,000 in April 2017. "Sellers are pricing properties to sell and it shows," said Adam Vellano, West Coast Sales Manager, BEX Realty - Florida. Carroll agreed and added, "The market for homes above $1 million is hot. If we can maintain current inventory trend levels - and I think we can - then sales of properties in this price point will be strong for at least a couple of years." 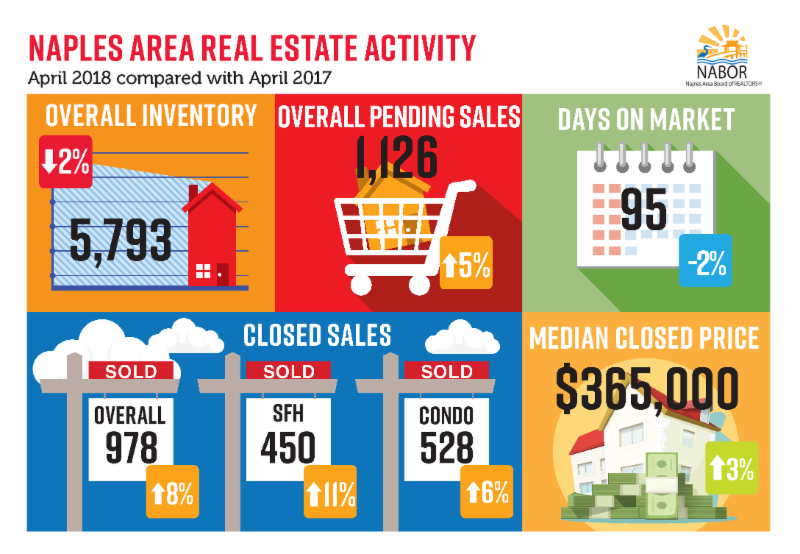 Overall closed sales increased 8 percent (month over month) in April to 978 properties from 902 properties in April 2017. And just like the first three months of the year, the high-end of the market continued to outpace other price categories tracked by NABOR® in April. As shown in the report, the number of closed sales of homes between $1 and $2 million increased 34 percent, while closed sales of homes over $2 million increased 15 percent in April. "Closed sales of single-family homes in April were up 11 percent with an increase in every price category except the $300,000 and below range, where there are only 300 single-family homes on the market," said Brenda Fioretti, Managing Broker at Berkshire Hathaway HomeServices Florida Realty. Geographically, real estate activity was strong across the entire county, but closed sales of single-family homes in South Naples were most remarkable with a 51 percent increase to 62 closed sales in April 2018 from 41 in April 2017. "North Naples was also a shining star in April," said Fioretti. "Even though inventory was down 8 percent in this geographic area, its year over year pending sales increased 9 percent, the highest of all geographic areas tracked. And its closed sales increased 13 percent year over year too." April's month over month activity was even more impressive in the North Naples area, as reflected in a 26 percent increase in closed sales. Similarly, the median closed price of condominiums in North Naples dropped 14 percent in April to $258,000 from $300,000 in April 2017. If you are looking to sell a home in Naples, contact a REALTOR® who has the experience and knowledge to provide an accurate market comparison so you can determine the right asking price. A REALTOR® can also ensure your next purchase in the Naples area is a success. Find out more at Naplesarea.com.